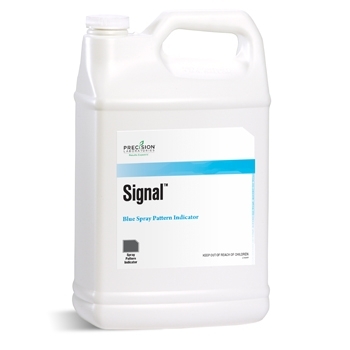 SIGNAL is a concentrated, temporary, blue spray pattern indicator and solution colorant designed to be added to plant protectants and other liquid spray solutions. SIGNAL provides highly visible evidence of where a spray application has been made. SIGNAL eliminates waste due to overlapping and skipping, while it indicates drift and improper application. 1 quart per 100 gallons.